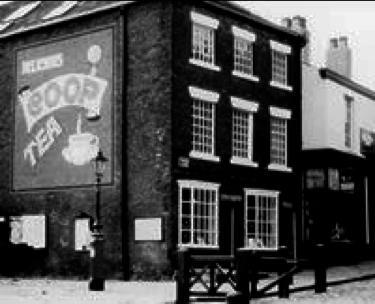 In December of 1844, a group of community activists established the Rochdale Society of Equitable Pioneers, opening a humble, community-owned grocery store in the North of England. While this food co-op seemed a modest effort on the surface, its success eventually changed the world, launching a global movement for economic democracy that today includes more than a billion members worldwide. Rooted in values such as democracy, equality and solidarity, co-ops empower people to meet the needs of their communities through democratically governed, community-owned enterprise. Monadnock Food Co-op in Keene, NH, has 6 local gift ideas highlighting local products for your holiday celebrations. Can’t decide what to get your loved ones? Many co-ops in our region, such as the Willimantic Food Co-op in CT offer gift cards or certificates for the special people on your list. To find a food co-op near you, visit: http://nfca.coop/members. The Howard Bowers Fund offers grants for the training and education of food co-op staff, managers, and board members. You can make a special charitable donation in honor of recipients of the NFCA’s “Neighboring Co-operator” Award, including Alex Gyori, former General anager at Brattleboro Food Co-op, and Terry Appleby, retiring General Manager at Co-op Food Stores / Hanover Consumer Co-operative Society. The Ralph K. Morris Foundation provides resources to help emerging leaders expressing interest in applying and advancing the principles of co-operation, and in promoting farmland preservation, land stewardship and sustainability. Their support has enabled people to access educational opportunities and networking such as conferences. The Co-operative Management Education program at Saint Mary’s University offers and online Master of Management program and in-person opportunities for co-operative professionals. You can support scholarship resources by giving online at http://www.smu.ca/giving/ways-to-give.html. Be sure to specify that your gift is for the “Leadership in Co-operative Management Education Bursary (Sobey School of Business)”. Your support will help ensure that the next generation of leaders has the tools they need to grow the Co-operative Movement for the future. Our food co-ops build an economy that is owned by and accountable to the people who use it and is rooted in a healthy, just and sustainable regional food system. Last year, the 35 food co-ops and start-ups of Neighboring Food Co-op Association were owned by more than 130,000 people like you, generated annual revenue of $315 million, purchased more than $60 million from local businesses, and provided good jobs to over 2,000 people in our region, paying annual wages of over $49 million (2016). 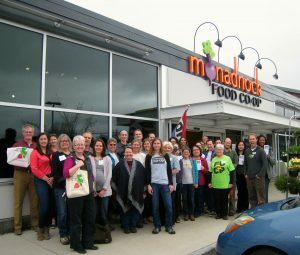 Imagine the impact in our region if 10 more food co-ops opened their doors! We love working with Food Co-op Initiative to help start-up food co-ops organize and open. In their first 10 years, Food Co-op Initiative (FCI) helped over 141 startup food co-ops to open their doors. With direct support, online training, educational tools, and our FCI Seed Grant programs, we’ve effectively helped startup food co-ops learn, communicate, connect, and get their stores open. 10 years = 130 NEW food co-ops = 1,020 jobs = 130 newly resilient communities! We also partner with Cooperative Fund of New England to support new co-op start-ups. Making a tax-deductible contribution to CFNE helps get field staff out to meet, coach and help groups organizing new co-ops to obtain the financing and technical savvy they need to succeed. Looking for a great, local cheese for your holiday celebrations? 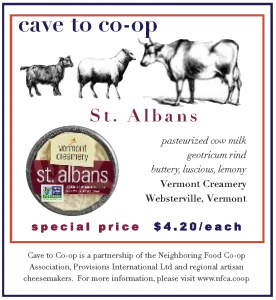 Try St. Albans, from Vermont Creamery. Made from milk sourced from St. Albans Co-operative Creamery in Vermont, hand-shaped and aged for eleven days, these delicate cheese disks are packaged in sturdy ceramic crocks which serves as an ideal vessel for baking; warm St. Albans in the oven for a decadent, silky fondue and serve with sliced baguette or roasted fingerling potatoes. A delicious cheese to share this holiday season, and a great way to support our region’s artisan cheese makers and co-operative farmers! During the holiday season, we follow traditions that keep important celebrations alive. As we prepare meals and break bread with family and friends, we can also remember to thank the people who grow the abundant food for our tables, and support policies and programs that will help them to continue to increase their productivity. In this country and around the world, the foundation of our food system is the family farm, a proven model for stability, sustainability and productivity. Because the family farm model represents 98% of all farming households worldwide, the key to feeding the global population is to provide a fair playing field for family farmers and ranchers. We can also advocate for policies that promote co-operative development, enabling producers to achieve the scale needed to meet growing global demand while supporting local ownership and control. As you consider your year-end giving, we hope you will consider becoming a friend of our region’s farmers and fishermen by joining the New England Farmers Union, giving a gift membership, or making a special year-end charitable contribution to the NEFU Education Foundation. A thriving regional food system needs the voice of our region’s family farmers and fishermen. For more information, please visit www.newenglandfarmersunion.org.